Boys dark navy patent formal lace up shoes, perfect for all formal occasions including a christening, wedding, special occasion. 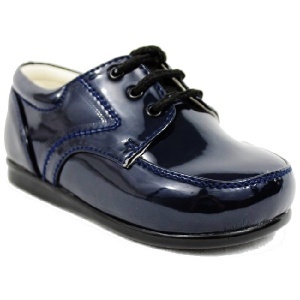 These lovely formal shoes are of a dark navy plain shiny patent. They have a lace up fastening with a hard sole for walking toddlers / children. They come complete with all inside shoe packaging to keep the shoe in shape and are supplied in an 'Early Steps' black shoe box with wrapping tissue. These are a perfect compliment to our boys navy suits.